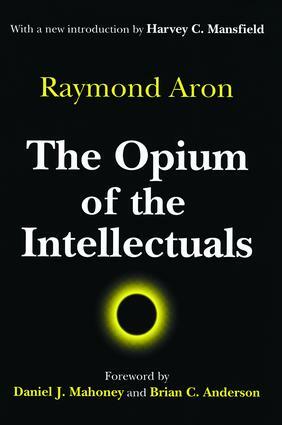 Raymond Aron's 1955 masterpiece The Opium of the Intellectuals, is one of the great works of twentieth- century political reflection. Aron shows how noble ideas can slide into the tyranny of "secular religion" and emphasizes how political thought has the profound responsibility of telling the truth about social and political reality-in all its mundane imperfections and tragic complexities.Aron explodes the three "myths" of radical thought: the Left, the Revolution, and the Proletariat. Each of these ideas, Aron shows, are ideological, mystifying rather than illuminating. He also provides a fascinating sociology of intellectual life and a powerful critique of historical determinism in the classically restrained prose for which he is justly famous.For this new edition, prepared by Daniel J. Mahoney and Brian C. Anderson as part of Transaction's ongoing "Aron Project," political scientist Harvey Mansfield provides a luminous introduction that underscores the permanent relevance of Aron's work. The new edition also includes as an appendix "Fanaticism, Prudence, and Faith," a remarkable essay that Aron wrote to defend Opium from its critics and to explain further his view of the proper role of political thinking. The book will be of interest to all students of political theory, history, and sociology.